Be On the Lookout. There were two BOLOs this week in Abaco. First, a 24’ outboard rented from Blue Wave was reported missing. A couple had checked into a local resort – their things were still in their room, but they and the rental boat were missing. After four days of missing boat reports on the morning net, there was an announcement that the Blue Wave rental boat had been found in West Palm Beach, Florida, at a dock. No sign of the couple. Then a report, perhaps speculation (? ), that all charges at the resort were on a phony credit card. So they apparently got here and then took the boat to Florida. Why? Second BOLO: Eighty Haitians on a 40’ boat landed near Little Harbor at the southern end of the Sea of Abaco. There were sightings of the boat trying to find and enter the narrow cut there after dark and then the boat went west and foundered on a reef near shore. It was rough and waves pushed the boat up towards the rocky beach, although it apparently didn’t break up. Fifty-seven Haitians have been rescued; more are suspected to be either “in the water or in hiding.” There was no explanation as to why the authorities thought 80 were on board. According to the morning net, they will be sent back to Haiti. 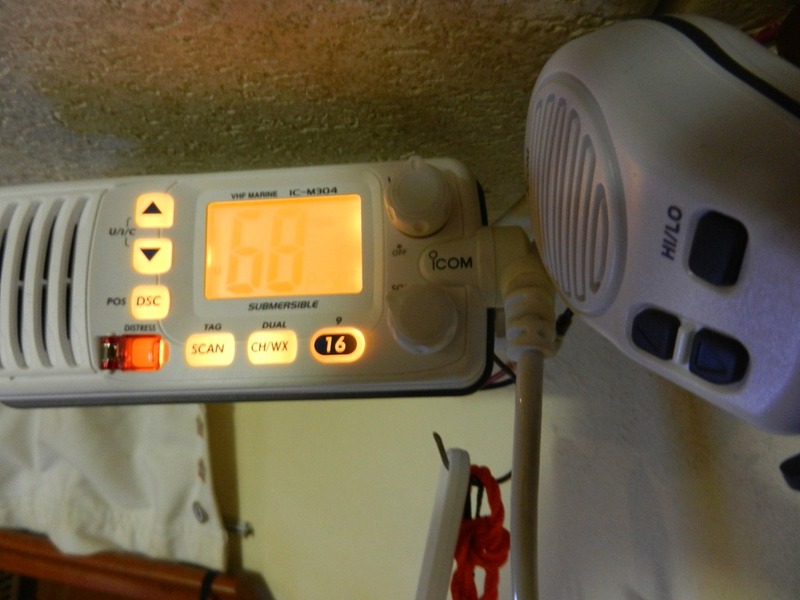 The morning cruisers’ net: This is how we get local (Abaco) news — we listen on our VHF radio, channel 68 at 8:15 a.m. Here is our boat radio; we also have a (portable) handheld. Volunteers from among the regulars here present a sort of radio program. First BOLOs, then weather and tides, then conditions in the cuts. These is followed by announcements for local events and then the restaurants and bars all advertise their specials. Boaters can call in their comings and goings; and there is also space for emergency contacts. It only takes a few minutes and it keeps us all up to date and gives us a sense of community. Even the cottagers have VHF radios – it’s how everyone communicates. Drug runners sometimes steal boats and run them to Florida…. However they don’t usually go after rentals and tend to steal boats with powerful Yamaha engines. Very interesting. I, too, thought of NPR as that is what I listen to every morning! ← The Bolt – Success!! !